May 3, 2017 April 18, 2019 JohnGames / Gaming5 Comments on Pandemic Cthulhu – Reskin or Something fresh? I recently had the opportunity to play Pandemic Cthulhu. As a fan of HP Lovecraft, and a fan of Pandemic (The Game, not a disease running rampant across the globe in real life), I thought to myself “I am going to enjoy this”. Spoilers. I did. For anyone unfamiliar, Pandemic is a cooperative game where players take the roles of specialists from the CDC and attempt to stem 4 diseases that are outbreaking across the planet. Strategic use of the players, and their various special abilities can mean the difference between living in a disease free world, or a riddled post apocalyptic wasteland. Pandemic Cthulhu takes similar play mechanics, and puts them to work in the towns of Arkham, Innsmouth, Dunwich and Kingsport. For anyone who doesn’t know, these are fictional towns located in Maine, the US. (I believe they are all fictional. Arkham certainly is). Instead of diseases to deal with, the players have to close 4 portals. To make things more taxing, cultists are everywhere making things more difficult and Shoggoths spawn, trying to escape via the closest open portal. Each time they do, one of the Great Old Ones wakes (a bit) and causes a persistent effect on the game. The seventh to wake is Cthulhu, and when that happens it is game over. You lose. So, in terms of similarities, each player takes an investigator that has unique abilities. I played the Occultist, who can spend actions to move Shoggoths and Cultists about. In terms of differences, there are a few minor things. In original Pandemic, when there are three disease cubes in one city and you need to add another, you get an outbreak to adjacent cities – which can cause a chain reaction outbreak. In this game, bad stuff happens but cultists don’t outbreak or have chain reactions. Card trading/usage for movement is significantly streamlined versus the original game. The movement of the Shoggoth makes things more difficult as if you leave it alone, you will ultimately lose by default. 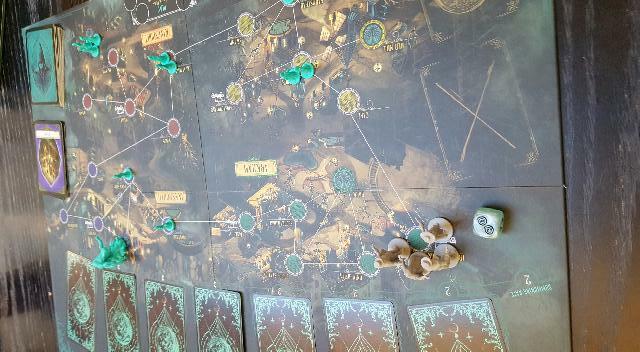 And if you have to place a Shoggoth on the board, and there are none left (there are three in the box), you lose. We lost on turn three. This game was fun. I don’t think I would get both games, as they are too similar. I would play this one again. I’d play the original again. Both were fun, but in my opinion it is a reskin, the differences are mainly aesthetic, or streamlining of rules that you might get as a free pdf. If you are a fan of Lovecraft, it is definitely for you. If you already own Pandemic, I do not believe it is worth getting this one. If you don’t, then it is worth your time. I don’t own any board games myself, but I do head to gaming cafés with friends sometimes. Pandemic is one of our go-to board games. As a Lovecraft fan, this definitely looks like a fun twist! Yeah, am a Loveccraft fan as well. Any game by Matt Leacock, which I think Pandemic is one of, tends to be good fun and quick to play. They are usually cooperative too.